Google runs a Cloud Print service that can make any printer, internet-enabled or not, accessible from over the web. If there’s a printer you need to get at from anywhere, whether on a computer, tablet or phone, here’s how to get it set up. A lot of modern printers come with Google Cloud Print built in now, and are able to take commands from you directly over the web (via Google’s servers). Getting an older printer connected isn’t difficult, though, if it can’t access the web on its own, you need to leave a connected computer up and running at all times. Before you do anything else, get the printer connected to your primary computer (the one you’re going to use to access it through in the future), consulting the instruction book or manufacturer’s support site if necessary. Once the printer can be ‘seen’ by your computer operating system, it can be added to Cloud Print. Next, you need Google Chrome for Windows or Mac installed, if it isn’t already. Type chrome://devices into the address bar to bring up devices Chrome can currently work with, then click Add printer and make sure the printer you want to link is ticked—there’s also the option to automatically add new printers in the future. You can manage your printers from the same devices screen. Click Manage next to any of the printers listed to upload new print jobs, rename or remove printers, or share a printer with someone else. This lets you give certain people access to your printer. It’s possible to print from mobile devices too. Use the Cloud Print app on Android and a print option should appear in the sharing menu of most apps (well, those that support printing anyway). 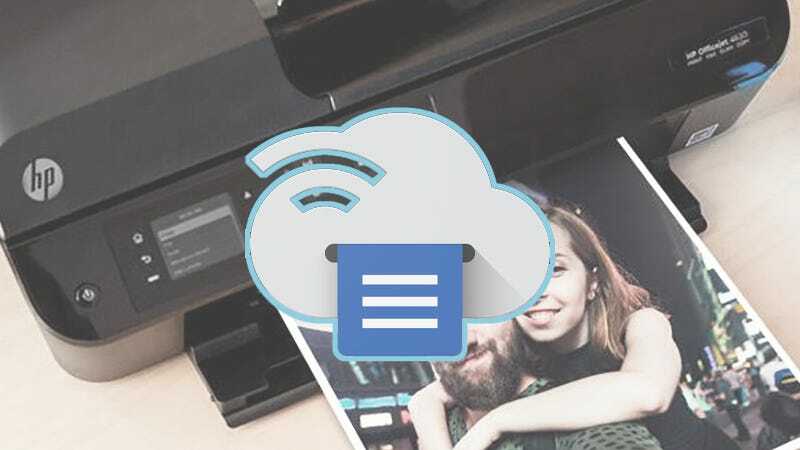 It’s slightly trickier on iOS as there’s no similar Cloud Print app, but you can still cloud print directly from Google’s iOS apps, or use PrintCentral Pro (which is recommended by Google) to bridge the gap. As you would expect it works perfectly well with Chromebooks too (just choose Print from the main menu). The only thing you can’t do from the other side of the world is replace the ink.